Samsung is introducing Samsung Galaxy J5 Prime Smartphone for its valued customers of the World along with remarkable technologies. It is fantastic Smartphone has produced by Samsung with reasonable rates for its valued buyers throughout the Globe because it is providing phenomenal latest Smartphones features in this product for using with correctly. This is huge surprise launched of Samsung in this year 2016. This hand-set is giving option of Android system with updated version of Marshmallow and it is also providing speedy Quad-core processor of 1.4 GHz for using multiple things or mobile application without any difficulties. Samsung always provides excellent RAM feature in its launched Smartphone and it is also serving 2GB RAM option in this newly launched hand-set. This hand-set gives multiple qualities of features like it is giving multi-touch display option along with finger-print sensor feature. The camera quality of this Smartphone is also very astonishing in cheap rates because it is giving 13.0 mega pixels rear and 5.0 mega pixels front camera feature for using with correctly. 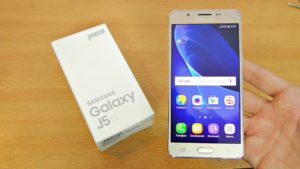 This cellular phone is updated version of Samsung J5 Smartphone and this Company has included some unique facilities in this newly launched product. It is also giving 3G and 4G internet usage facility of its cellular phone users and they can avail both type internet services after buying this hand-set. Get the full details of hand-set specification from the below. System: Android OS V6.0 Marshmallow. Processor: Quad-Core 1.4 GHz Cortex-A53. Memory: 16 GB Built-In memory. Rear Camera: 13.0 mega pixels (Geo tagging). Front Camera: 5.0 mega pixels (Touch-focus). Display Screen Size: 5.0 inches. Display Pixels: 720 x 1280 pixels. Display Colors: IPS LCD capacitive touch-screen display and 16M Colors. Bluetooth, Micro USB v.20, GPRS, EDGE, WLAN, Wi-Fi, Wi-Fi direct, Wi-Fi Hotspot, A2DP and USB Host. Audio: 3.5mm audio jack, MP3, MP4, Flac Player, WAV Player and Other multi-media player. Ringtones: Polyphonic ringtones, MP3, MP4, Sound-recording, WAV Files and Downloadable. Other Features: GPS Supported, A-GPS Supported, Speaker-phone, FM-Radio not confirmed, Calendar, Face-detection camera option, Document viewer, Photo/Video editor, SNS integration, Google searches and Micro SIM. Latest Features: Finger-print sensor, Corning gorilla glass display protection,Accelerometer sensor,Multi-touch display option, G-talk,Proximity sensor, Video 1080p@30fps, HDR camera option and External micro-SD storage up to 256 GB with dedicated slot.